You can find my professional network on LinkedIn. 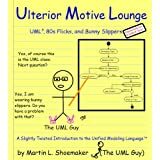 The UML Guy, my Software Architecture Analyst page. Software Basement Tapes, my Windows Phone 7 game page. Shoemaker Writes, my science fiction writing page. Martin L. Shoemaker, my personal page. The UML Guy, my Software Architecture Analyst site (i.e., this site). Software Basement Tapes, my Windows Phone 7 site. Martin L. Shoemaker, my writing site. Old Town Tales, my writing and personal blog. And you can always leave me a comment on any post on this site.